Although I do sell herbs and nutritional supplements, there are many things that are important to improving health that don’t involve swallowing something. In fact, there is one key to helping people improve their health that has solved more health problems than anything else I’ve ever learned. It has helped me resolve cases where people had been to numerous doctors and healers but had made no progress. It is an underlying problem in all chronic illness. This problem is tension in the solar plexus and/or a hiatal hernia. Jack taught me that all chronically ill people have a hiatal hernia. I’m not sure that this is the case, but I do know that nearly all chronically ill people have tension at the solar plexus that is interfering with digestion and breathing. Whether this condition would be considered a full-blown hiatal hernia by the medical profession or not, I don’t know. The diaphragm muscle is supposed to contract downward into the abdominal cavity to expand the chest area when we inhale. As the diaphragm relaxes upward, we exhale. This is why a baby’s tummy rises and falls when they are breathing. The movement of the diaphragm causes the abdomen to expand outward when we inhale and relax inward as we exhale. When the stomach is in the way of the diaphragm, it can’t move like it is supposed to, so the person can’t take a deep abdominal breath. In order for the person with a hiatal hernia to take a deep breath, they must lift their chest and shoulders. Chronically ill people are almost universally chest breathers. Occasionally, with a little coaching they can take a little bit of an abdominal breath, but even then it is strained, suggesting that they may have a partial hiatal hernia. Some chest breathers seem able to be taught how to breathe abdominally and can do it with coaching. This suggests they don’t have a hiatal hernia, but they still have tension in the solar plexus, which is inhibiting breathing. I believe this tension is adversely affecting digestion, too, even though the problem is not actually a hiatal hernia. Medical literature suggests that 1-20% of the population have a hiatal hernia, but about 95% of the people I see have problems breathing deeply from their diaphragm. While this doesn’t mean they have a medically-diagnosable hiatal hernia, it does suggest they have problems with both breathing and digestion that are contributing to their health problems. That’s bad enough, but the problem doesn’t stop there. Besides causing shallow breathing, the hiatal hernia also inhibits digestion. It causes stress on the nerves to the stomach, which reduces secretion of acid and enzymes. As a result, proteins are not properly digested and minerals are not properly absorbed. This is why people with severe hiatal hernias lack muscle tone and are often very sickly. Many young people with this problem are excessively thin, while older people tend to be overweight with poor muscle tone. Depending on how far up into the diaphragm a person’s stomach protrudes, a hiatal hernia may or may not cause problems with acid reflux. If the stomach is in certain positions, the sphincter at the top of the stomach will not close properly to hold acid in the stomach. In my experience, people with chronic acid reflux always have a hiatal hernia. However, the reverse is not true—not everyone with a hiatal hernia experiences acid reflux. The ironic thing is that people with hiatal hernias don’t produce enough hydrochloric acid to properly digest food, but because they are prone to acid indigestion, heartburn and acid reflux, they are frequently neutralizing what little acid they do produce with antacids and acid blockers. The result is a vicious downward spiral of declining digestive function and general health. The problems we’ve discussed so far are directly caused by the hiatal hernia, but there are also numerous secondary problems caused by this condition. For instance, a hiatal hernia will often cause frequent gas and bloating. This is because improperly digested protein will accumulate in the intestinal tract and contribute to intestinal irritation and inflammation. Poorly digested food irritates the ileocecal valve (which separates the small intestine from the colon) causing it to become inflamed. When the ileocecal value is inflamed, it swells and the swelling prevents it from shutting properly. This allows bacteria from the colon migrate into the small intestines and feast on the sugars in the small intestine. This will cause severe gas and bloating. I’ve relieved many severe cases of bloating just by closing the ileocecal valve. An open ileocecal valve is like having your septic tank or the sewer back up into your kitchen. Not a very pleasant thought is it? About 95% of all people with a hiatal hernia also have an open ileocecal valve, although occasionally you’ll find one without the other. An open ileocecal valve weakens the entire body. You can locate the ileocecal valve by drawing an imaginary line from your belly button to the protrusion of bone on the front of your right hip. The ileocecal valve is located just under the halfway point along this line. Find this point right now and press inward. 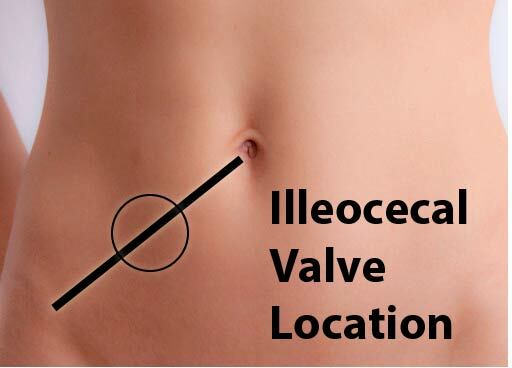 If you feel pain when you press on this spot, you probably have an open ileocecal valve. You can close it by massaging this area using small circular movements while breathing deeply. When the pain goes away, the valve is closed. You’ll probably need to do this at least once a day for a few weeks to keep it closed. The shallow breathing and lack of hydrochloric acid (HCl) production can cause an over acid pH in the body, which makes a person more susceptible to infection. Lack of HCl also makes one more prone to infection because HCl kills infectious organisms in the stomach so they can’t reach the small intestines. Lack of HCl also makes one more prone to fungal infections. A hiatal hernia is a mechanical problem. You can’t fix it just by taking nutritional supplements. You have to mechanically manipulate the stomach downward from the diaphragm. The handout on the facing page offers several suggestions on how this can be done. All of the listed techniques actually work. Feel free to duplicate and share this handout. The question naturally arises, what causes a hiatal hernia? The problem is typically attributed to physical issues, such as excess weight, pregnancy, lifting heavy objects, constipation and frequent coughing. I’ve observed that a large percentage of women in their 8-9th month of pregnancy develop this problem. Many obese people also have this problem. However, those who seem to have it the worst are usually very thin, not pregnant or overweight, which suggests other causes. Jack Ritchason and other natural healers often attribute the problem to intestinal gas and bloating putting pressure on the stomach, but I think that this gas and bloating are not primary causes of the problem. They may aggravate it, but they aren’t the cause. For a long time I accepted that idea that the hiatal hernia was linked with suppressed anger, but I discovered that there is a deeper problem at work—not paying attention to one’s guts. In other words, not listening to one’s instincts. You’ve probably heard the phrase “gut instinct.” Well we all have gut instincts because we have a “gut brain.” The nervous system and the digestive system develop from the same embryonic tissue and the guts produce neurotransmitters just like the brain. There are also more nerves sending messages from the intestines to the brain than there are nerves sending messages from the brain to the intestines. Most people in modern Western society don’t pay much attention to the messages their guts are sending. But, guts can and do “speak” to us, and we can learn to listen by paying attention to the solar plexus. If the oil has a positive effect, you’ll see them relax a bit, breathe more deeply and lean forward slightly. If the oil has a negative effect on them, you’ll see them tense a bit, breathe more shallowly and lean slightly backwards. This observable reaction will center on the response of the solar plexus to the oil. Try several different oils to observe different reactions. I’d like to make the case that body, mind and spirit are equally important, completely interactive, and that the mind is not the only source of “knowing.” Yes, we can learn and do things through our mind, but the guts (which represent the body) and the heart (which represents the spirit or soul), know things the head does not. There is emerging scientific evidence for this viewpoint. Research is showing that we have a “gut brain” and that every part of our body “thinks” or has intelligence. However, rather than talking about the science, let me give you a practical example from my own life about the value of listening to one’s guts. About a year or two after I first learned about the solar plexus response I was driving back to Roosevelt from Salt Lake City here in Utah. It was late at night and I was traveling in a friend’s car. Right after leaving Heber City, my solar plexus knotted up. I knew this meant that something was wrong, but I didn’t know what. I started asking questions mentally, “Is it this? Is it that?” The knot in my stomach just kept getting tighter and tighter, and I was getting more and more concerned. What was wrong? After about five minutes of trying to figure it out, I suddenly saw the ‘real’ gas gauge. What I thought was the gas gauge was actually the temperature gauge. The gas gauge was on empty. As soon as I realized I was nearly out of gas, the knot in my stomach relaxed and I breathed a “sigh” of relief. (That’s how your solar plexus lets you know you’ve got it right.) I turned the car around and went back to Heber City to fill up the tank. It’s about 80 miles from Heber City to Roosevelt, and there is only one gas station on that entire stretch of road—and it isn’t open at night. I would have run out of gas on a lonely stretch of road in the middle of nowhere late at night if my solar plexus hadn’t alerted me to the fact that something was wrong. Since that experience, I’ve learned to “pay attention” to my solar plexus more and it has helped me out in many situations. I believe the solar plexus is the body’s way of “talking” to you. As with muscle testing, the body is sensing the vibrations of influences around you and picking up information through the various senses. When the body senses vibrations or inputs that are dangerous, it responds through the solar nerve plexus and we “feel” something in our abdomen. Besides listening to the solar plexus, where the body talks to us, I also believe that we should listen to the heart, where our emotions talk to us. The heart also produces hormones and neurotransmitters and thus, “thinks.” My heart has told me things many times that my head couldn’t understand, but things have always turned out better when I’ve listened to my heart and not allowed my head to override it. Both the heart and the body are able to sense things that the physical brain doesn’t know how to process into words. Words are secondary to experience, simply being a representation of experience. We should trust experience over words and the subjective experience of our own heart and gut instincts over the word-based knowledge that we were programmed with since childhood. It’s time to wrap this all up and explain what I believe to be the underlying cause of the hiatal hernia and why it appears to be universally present in chronic illness. Let’s just suppose for a moment that I am correct when I say that the solar plexus response is our internal “muscle testing” sensor that is designed to tell us what is good for us and what we should avoid. However, we don’t listen. We just ignore the message. Thus, day after day we are doing things that cause our solar plexus to tense up. Over time, this builds into a chronic tension that interferes with breathing and digestion. At the least, we develop chronic tension in the solar plexus. At worst, we develop a hiatal hernia and its attending problems. The constant harm we do to the body also leads to chronic illness. If we were paying attention to what the body is trying to tell us, we would be able to avoid most harmful influences. However, we have been taught to override the wisdom of the body and replace it with the “learning” of the brain. Few people, even in the natural health movement, actually try to listen to their body. It’s all about “head” knowledge. It takes courage to follow your instincts. It takes real courage to chose to not do something that everyone else says is “perfectly safe” when your instinct tells you it’s not. It takes courage to not fall in with the group—family, friends, religion, societyÃ„Âand make choices that are different because of what your instincts and heart are telling you. This is especially true when you can’t logically justify why you are making those choices, when it’s just a “feeling” you have. That’s why they call it “guts.” Courage takes “guts.” Do you have the “guts” to listen to the wisdom of your body and heart? Do you have the courage to make a choice that you can’t logically justify because something simply “feels” right or wrong? That’s really having guts. I encourage you to stop ignoring the tension in your solar plexus and start doing the things that allow it to relax. I guarantee that both your digestion and your health will improve. Start by checking your breathing. Accessing your pattern of breathing is the first step in correcting a hiatal hernia. Put your hand on your abdomen as you breathe. If your abdomen moves in and out more than your chest, you are probably handling your stress well, or at least, you aren’t letting stress control you. You probably don’t have a hiatal hernia, either. If you are breathing from the top of your lungs, just sit back and relax to allow your breathing apparatus to revert to normal abdominal breathing. If it doesn’t, then you need to relax the diaphragm and help your stomach move downward. To do this, take lobelia essence or blue vervain in liquid form. Then, practice breathing from the abdomen again. You can also practice abdominal breathing while relaxing in a bath with lavender oil. It is also helpful to massage your abdomen, especially in the area under the rib cage while concentrating on breathing deeply. 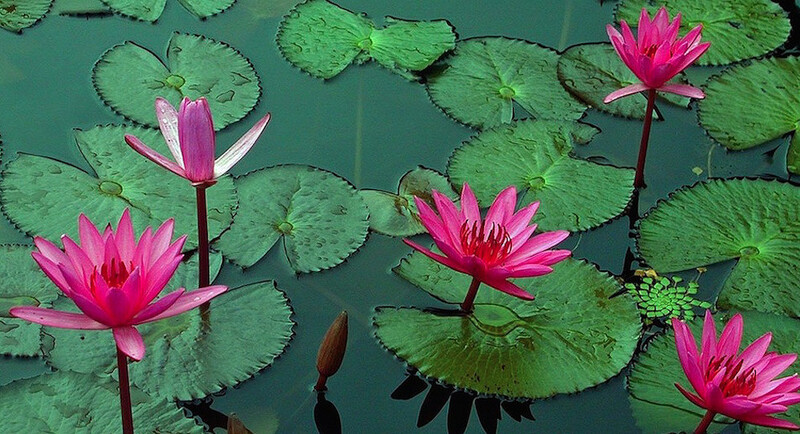 When you are practicing breathing deeply, practice exhaling completely. Force as much air out of your lungs as you possibly can before inhaling again. This both exercises and relaxes the diaphragm and will help bring down the stomach. Find healthy ways to vent your repressed anger and frustration. This releases tension from the diaphragm and will help defuse much of the tension maintaining the hiatal hernia problem. For example, try taking a long, slow deep breath and feel the tension build up in your diaphragm (like you are starting to get angry). Make your hands into fists and raise them up in front of you as if you want to punch somebody. Exhale forcefully with an angry “huh!” sound while shaking your fists downward like you are hitting something. Do this several times, safely discharging your inner tension and frustrations. You can also throw a mini-temper tantrum. Again breathe in deeply, clench your fists like you are angry and then as you exhale, yell, scream or just use a sound like “arrr” while shaking your fists and stomping your feet like a little child throwing a tantrum. This may sound really stupid, and may be very hard for you to do, but I’ve seen the stomach come down and the diaphragm noticeably relax after someone has done this. Other methods of dealing with stress include changing your environment, finding new ways to resolve problems and communicating your thoughts and feelings honestly with others. It is also possible to bring down a hiatal hernia using manual manipulation. Find a chiropractor a massage therapist who knows how to manually manipulate a hiatal hernia. You can also massage your own abdomen daily for about 5-15 minutes paying special attention to massaging the area under your ribs. As an alternative, the following technique can be used as a self-help form of manual manipulation. Drink a pint of warm water first thing in the morning. Next, stand on your toes and drop suddenly to your heels several times. The force of this little jump and the weight of the water help pull the stomach down in place while the warm temperature of the water relaxes the stomach area. Taking a dropper full of lobelia essence with the water will relax the stomach and make the treatment more effective. f this doesn’t solve the problem, place both hands under your breastbone in the center of your rib cage. Take a deep breath and press your fingers firmly into the solar plexus area (just under the breastbone). As you forcefully exhale, push your fingers downward and bend forward slightly. Be careful not to push your fingers up under the rib cage. Repeat this action several times. Do this before meals on an empty stomach. It is usually important to work on the ileocecal value when correcting the hiatal hernia. This valve is located on the right side of the abdomen midway between the belly button and the right hip bone. Just start massaging in that area and if there is any pain or discomfort in that region gently massage the area while breathing deeply until the pain goes away. Do this at least once a day. Finally, although nutritional supplements won’t correct a hiatal hernia, they will help it heal as you mechanically get the stomach to move downward. Supplements can also help the ileocecal value, which will help the hiatal hernia to heal, too. The companies that make these supplements are listed in parenthesis after the supplement(s). Red raspberry is a very good herb for toning abdominal muscles and is useful to take in capsules or teas when correcting a hiatal hernia. Trace mineral supplements such as Colloidal Minerals, Mineral Chi Tonic or HSN-W (NSP) will also be helpful in promoting healing from a hiatal hernia. To correct the ileocecal value problem and improve the hiatal hernia problem at the same time I have found two formulas to be helpful. One is Intestinal Soothe and Build and the other is Spleen Activator. Slippery elm is also useful here. People who suffer from a hiatal hernia also benefit from taking digestive enzymes. My favorites are Proactazyme (NSP), Digestazon Plus (Amazon) and Absorb-Aid (a health food store brand). To treat hiatal hernia syndrome that is accompanied by heartburn, use slippery elm powder mixed with a little juice or water or whole leaf aloe vera juice. If you continue to get acid in your throat, sleep with your head and chest slightly elevated. Elevate your pillow to raise your head and chest. I find flower essence to be very helpful in correcting the underlying emotional issues that contribute to a hiatal hernia. Dandelion flower essence in particular is very helpful, which is interesting to me as Jack Ritchason taught me that dandelion was a very good herb for people with a hiatal hernia. Dandelion flower essence is for people who are two “uptight.” They over form and over plan their lives and don’t know how to relax and “go with the flow.” I’ve seen dandelion flower essence alone noticeably relax the diaphragm after just one dose. Chamomile and St. John’s wort are two other herbs that regulate the solar plexus and both can be helpful as flower essences for correcting a hiatal hernia. Chamomile is helpful for promoting a more relaxed, even and “sunny” disposition while St. John’s wort helps people get in touch with their “gut instincts.” Both are helpful as herbs, too. Finally, I might mention that people with the thyroid-type body build (tall and thin) usually have the most problems with a hiatal hernia. They also tend to have adrenal weakness and the two problems (adrenal weakness and a hiatal hernia) seem to go hand in hand. Building the adrenals helps one manage stress better, so I also recommend that people with a hiatal hernia work on building up their adrenal glands, too. Adrenal Support and Nervous Fatigue Formula (NSP) are the two supplements I use most often for this purpose. However, licorice root and adaptagenic herbs like Eleuthero root are also helpful. I have also posted video demonstrations on how to work on a hiatal hernia on yourself and others. Be sure to watch these videos. Since writing this article, I have also learned that SIBO (small intestinal bacterial overgrowth) is also a factor in this problem. So I recommend reading that article, too. We also have a longer webinar we did on Assessing and Correcting SIBO and Leaky Gut, which you can purchase in our store. Here are some video demonstrations I did about how to identify and correct a hiatal hernia. These videos are hosted on our YouTube channel.